Back in the 90s there was no tax penalty on company cars so young chargers such as me could drive whatever we wanted, as long as it was on 'the company car list.' And by god did we mistreat them. I was having a conversation on twitter recently about the Mk4 Vauxhall Astra. I've forgotten who I was talking with (let me know if it was you!) but I said it was a good car and he said it was a steaming pile of manure. In hindsight I've remembered that actually it was a pretty rubbish car but my memory of it was clouded by the fact I had a Mk4 Astra 1.8 SXi as a company car in 1999. Back then company cars came with hardly any tax penalty and what you drove was what was in your budget - simple as that. Some people say hire cars are the fastest cars on the road - but not then. Back in the mists of time when up and coming junior execs in shiny suits ruled the roads a company car was the fastest thing on four wheels. God I thrashed that Astra. The company I worked for wasn't very big and as such we weren't subject to the stricture of company car lists. My boss knew someone who owned a Vauxhall dealership and I could have whatever I wanted as long as it was under a certain price. My work took me all over the place but often to some remote farms and locations in North Wales reachable only by a rally stage. Oh yes, the rally king in his company Astra hooned around those forest stages with gravel banging and bashing on the underside of the car, brown rooster tails of mud flying from the wheels and hand brake turns flinging the car round hairpins. This might seem disrespectful to a car owned by someone else but that was how a generation treated company cars - like we'd stolen them. In the late 80s I worked for a large building company. I didn't have a company car as I was a trainee but my boss had an Orion 1.3LX, his boss had a Sierra GL saloon and his boss had a Scorpio 2.9 Ghia. The higher up the corporate ladder you climbed the better the Ford or Vauxhall you got. I drove all three cars but the Scorpio only once. The big boss wanted dropping off at the airport and I was to chauffeur him there and drive the car back to the office. 19 years old and driving a 2.9 V6, this was amazing! Sadly, though, it wasn't the rocketship I'd imagined it to be. Instead it was merely quite quick, but I still gave it my all thrashing the living daylights out of it. My dad's Jaguar XJ6 was a better car by a huge margin. In the early 90s I was back in the corporate world, in telecoms. There were around 20 of us of similar ages doing a similar job. Company cars were available, indeed compulsory, but were were restricted by a list. The list was long but our jobs were only allocated so many points which limited our choice. We could have had a loaded Mondeo or Vectra but none of us were interested in those. Almost everyone, me included, ordered a BMW 318i SE. 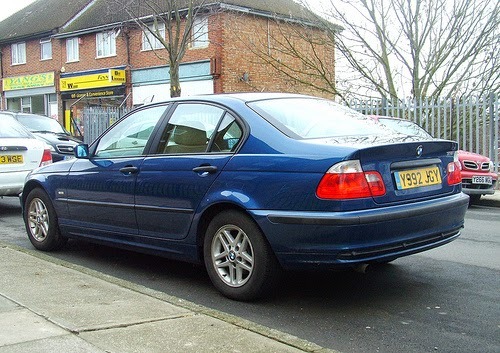 The BMW only had 115bhp but it was rear wheel drive and had alloy wheels (15 inch!). I drove it everywhere like my trousers were on fire. You could do donuts and drift in it if you tried hard enough. I still had it the moment my ex-wife told me her waters had broken and our son was shortly due to make his way into the world. That journey from my office in Warrington to home in Northwich has probably never been completed in such a short time. At one point I hit a hump-backed bridge so fast I got full air as all four wheels left the ground. Once son was born the company cars got more boring - my next was a Mondeo 2.0 TDCi Titanium estate - and I calmed down a little. A week before I left that company the Mondeo's engine decided to explode and I spent my final week in a hateful Vectra 1.8LX hire car. I actually turned down a job because the company car was a Toyota Avensis. Over the past ten years I've only owned private cars and I treat press cars with care. But those golden years when company cars were a status symbol and a race car all in one were glorious. Nowadays the Chancellor's meanness means youngsters stepping on to the corporate ladder have to choose an eco machine as their daily wheels because otherwise the tax is crippling. This is a sad state of affairs. They are missing out. I'm glad I come from a generation to whom company cars meant a lot more than they do now, and could be easily acquired and caned until the day they went back and we could choose another. Because, until few years ago, a company car was the fastest car on the road.